Georgetown offers a unique, public, nine hole executive golf course. The golf course is open to the public when not in use for member activities or leagues, and is a great place to practice your short game or teach a beginner the love of the game. Par is 28, with one beautiful par 4 where the long ball hitters can attempt to drive the green! Georgetown offers all the golf amenities you could want. We have men's, women's and junior golf leagues. We have instruction available for individuals in private lessons, group lessons or on course lessons. We have numerous tournaments throughout the season primarily for members. The activities on the golf course never stop at Georgetown. If you are looking for a fun, relaxed atmosphere where you can practice your game, this is the place for you. Follow the links below for more information on our golf programs and to register! Each golfer must have his or her own set of clubs. 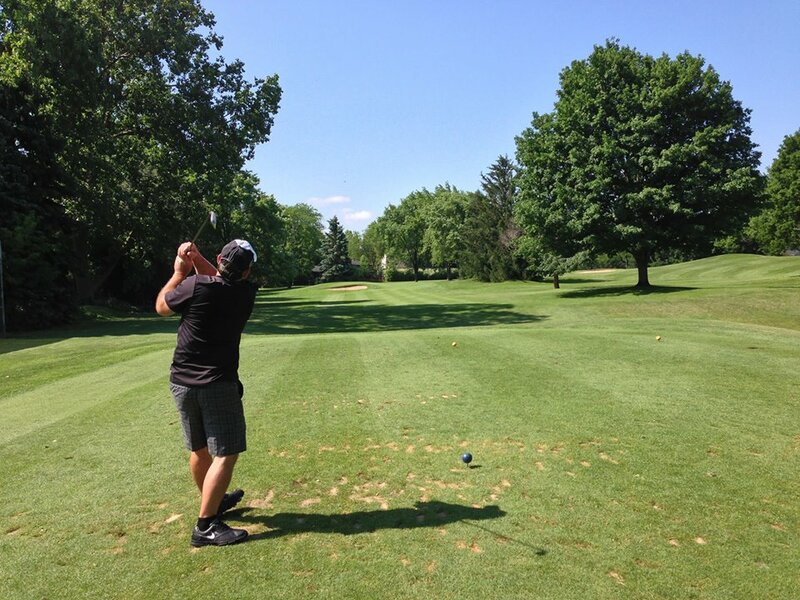 Georgetown has club rentals for $5, passes available (5 rounds for $45 and $40 for seniors), and cart rentals for $2! Members do not pay greens fees to play golf! Each golfer must have own set of clubs. USGA rules govern all play, with the exception of local rules. Proper golf course etiquette and rules are to be followed. Out of bounds are marked by utility boxes and adjacent streets. Please extend your consideration and courtesy to Georgetown property owners. Playing balls from neighbors' yards is not permitted. Each golfer assumes all risks and danger incidental to the game of golf and is personally liable for all damage to property or injury to persons, which result from golfer's actions. No walkers are allowed on the golf course. Any person that does not have proper golf equipment (two clubs, putter, and a golf bag) is not permitted on the course. Golfers must repair ball marks, replace divots and rake bunkers. Carts are not allowed on the greens. The course if for golf play only. Golfers are to play only one ball. Proper golf attire (shirts and shoes) must be worn on the course. Metal spikes are not allowed. Rental clubs are available but will not be issued within the last two hours prior to scheduled close. Youth age requirements are designed to encourage proper knowledge of rules, etiquette and behavior on the course. Youth members ages ten and older may apply for a junior discretionary pass to allow for play unaccompanied by an adult. Weekdays: youth fourteen years of age and older may play unaccompanied by an adult. Weekends: youth sixteen years of age and older may play unaccompanied by an adult. All golf play begins at the first tee. A maximum of four players are allowed in a group. Time of play is 1.5 for nine holes.